FATHER Eugene Stockton's 60 years of priesthood have been remarkable in many ways. 'this Indiana Jones of the Catholic priesthood survived war zones, uncovered archaeological breakthroughs, tackled 14 languages, started the Aboriginal Catholic Ministry and found time to complete two doctorates for his work as a seminary lecturer. "I'm a Catholic by accident;" said the maverick from his Lawson hermitage. The seeds of his destiny were planted during his Blue Mountains Catholic childhood imbued with faith and appreciation of the natural environment. His mother, Elsie, converted to the Catholic faith while working with religious sisters in the laundry of St Columba's Minor Seminary, Springwood. "She caught the bug from the nuns," he said. Elsie Stockton named tier youngest child after her former employer, St Columba's Rector, Msgr Eugene Brauer. Tragically, Eugene's father, Ernest, also a convert, died a few months after his birth. "My mother had to work hard to bring us kids up and she had quite a hard life, really. Well, she was a Yorkshire woman, known for their thriftiness and quite hard headed. "She provided a very secure home," he said. "When we moved up to Lawson, I used to go into the bush a lot with my mother away working each day. "Everyone thought I was a good little boy;" the 82-yearold priest said with a glint in his eye. Little did they know young Eugene was rummaging about the bush of the Blue Mountains, exploring caves, swamps, rock outcrops and forgotten tracks, observing yabbies in still ponds, fleeting animals, birds and insects. 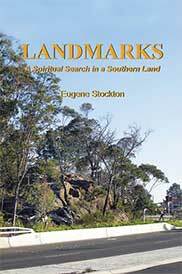 Years spent exploring the bush were the beginning of his lifelong interest in archaeology and Aboriginal spirituality. At only six years old he announced that he was going to become a priest. "The family tried to put me off that and I became more obstinate still. So I say I'm not sure I became a priest for the right reason." Years of philosophical and theological study followed at St Columba's Minor Seminary in Springwood, and St Patrick's Seminary in Manly. "The St Vincent de Paul Society had a number of scholarships. I think that's where my upkeep came from. I think I wasn't supposed to know." On March 8 1958, Eugene Stockton was ordained to the sacred priesthood by Cardinal Norman Gilroy in St Mary's Cathedral, Sydney, joining 21 others. It was a time of social change, the last year of Pope Pius XII's reign as Holy Father and the year when Albert Namatjira was charged with provision of alcohol to an Aborigine. Randolph Stow's To the Islands had just won the Miles Franklin prize, a novel recognising violence in a Christian mission to Aborigines. The erudite Fr Eugene was the first to complete the doctorate at the Catholic Institute of Sydney, then based at St Patrick's Seminary, Manly. During further study he went to the Pontifical Biblical Institute in Rome and the Ecole Bihlique in Jerusalem, completing a Licentiate in Sacred Scripture. "I was there when the Six Day War broke out;" he said. He was living at the British School of Archaeology at the time, later working for them during archaeological digs at Jericho. After being evacuated ahead of the war to Cyprus, Fr Eugene returned immediately to relieve the Director of the British School of Archaeology and complete his thesis at the Ecole Biblique under famed scholar Père de Vaux. "The British School inherited the British Consulate and I would take supplies down to Père de Vaux," Fr Eugene said. "Cigarettes were hard to come by and he was very happy to see me each day." Upon returning to Sydney Fr Eugene completed a doctorate in Archaeology at the University of Sydney and returned to his alma maters as a lecturer at St Columba's Minor Seminary, Springwood and St Patrick's Seminary, Manly. He would return to the Middle East for academic purposes, one time being thrown in a Jordanian prison under suspicion of being a Palestinian spy because of his dialect of Arabic. All the while Fr Eugene was an assisting priest at various parishes such as Parramatta, Penrith, Mt Druitt, Riverstone and Kingswood. He subsequently discovered Aboriginal artefacts in half a dozen excavations across the Blue Mountains and Nepean, the oldest artefact found was thought to be up to 50,000 years old. "We founded the Aboriginal Catholic Ministry in Parramatta in 1986," Fr Eugene said. Cardinal Gilroy appointed Fr Eugene as the first Chaplain to Aboriginal Catholics in Sydney, and then adopted a model where the community ran the ministry. "It's important to note that the idea of the Aboriginal Catholic Ministry was to get away from the mission idea and for Aborigines to run the centres themselves with help from outsiders like myself," he said. Since 2001 Fr Eugene has lived as a hermit, consecrated by Most Rev Kevin Manning, Emeritus Bishop of Parramatta, living a life of contemplation and solitude in the same village he discovered his lifelong mission of the priesthood.